Going for a creamy salted caramel with a sweet butter base on nuts profile. Added a tad bit of brown sugar extra to help the caramel. This recipe is the property of joelbryant1960 and released under the CC Attribution-NonCommercial-NoDerivatives 4.0 license. You may not copy, derive or commercialize this recipe without following the terms of this license or the explicit permission of the creator. I didn't make any subs, other than dropping the super sweet down to about half a percent. I thought it came out pretty tasty. Put my review in the wrong place!!!!! As mentioned in the discussion I subbed the butter cream and added the butter pecan as SlashaLo did as I too wanted a nutty aspect. I did use the sweetner per your recipe as I like my juice sweet also. It's not sugar lips just sweet enough. The AP is a backnote. Enjoying this will be added to my ADV rotation! 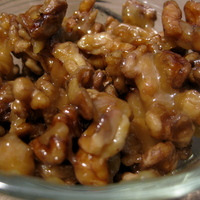 I am a fan of caramel/nut recipes. I found this one and wanted to mix it up as I was looking for a good salted caramel recipe. It was tasty after a few days like mentioned, but I think was MUCH better after about a week. It seemed to help the brown sugar meld into it a little better. I did not use the amount of SS listed, I do not like my mixes that sweet but I did include some sweetener. The AP gave it some good grit and a slightly nutty finish, but I had to look for it. I made a second batch and added 2% FW - Butter Pecan, to add a more nutty note, and the buttery part of that lends well with the ingredients you had. I think this is pretty good though as is, but needs more of a nutty ingredient to be called Buttery Nuts.